JJ’s Acres uses custom blended grass seed specific for our sandy soils and acidic grounds. We also offer fertilizer program that is highly effective in our Northwoods. Flagstone, paver or wet lay bluestone - JJ’s Acres can do it all. We custom design fire pits to compliment your landscape design – above ground, in ground, fieldstone or brick – no fire pit looks the same when designed by JJ’s. For those who desire the sound of tranquil water running in their landscape — JJ’s staff is the right team for the job. Whether you like concrete, timber or natural stone steps - we can tackle all your elevation needs. JJ’s Acres installs, performs seasonal start ups and shut downs and services Rain Bird irrigation systems. Our Northwoods area climate is zoned 3b – however, there are a few microclimates that will allow 4a and 4b zoned plants to survive. JJ’s Acres has a full selection of ground covers, perennials, shrubs and trees suitable for our area – including native, deer resistant, shade tolerant and drought tolerant options. From 7 gal container to 14’+ balled and burlap deciduous or evergreen trees – we have many selection to choose from – all of our large trees are grown here in the Northwoods and come with a one year warranty (with proper maintenance). Porous Pave is a permeable pavement with high porosity that allows rain water to pass through. 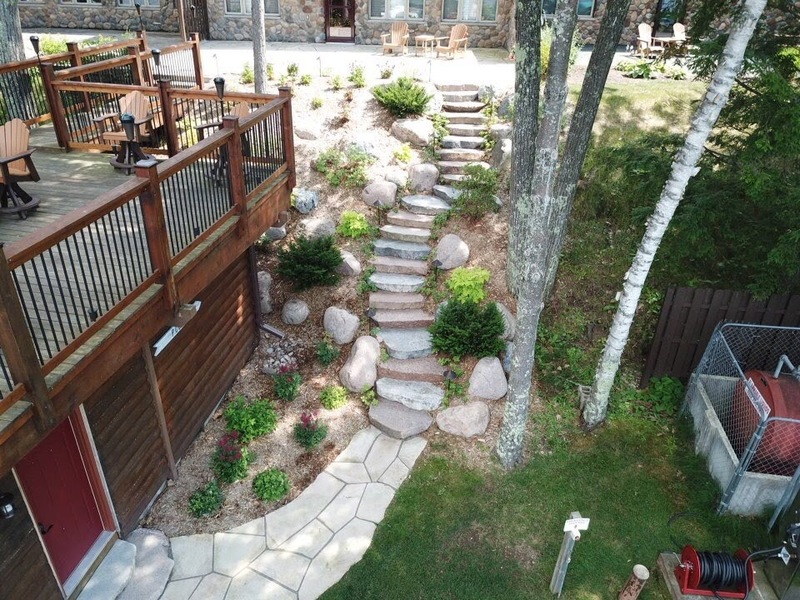 Engineered for our Northwoods climate and makes for great walkway, patio or driveway.